English embroidery designer, artisan and socialist. The youngest daughter of Pre-Raphaelite designer, WILLIAM MORRIS and the artist's model, Jane Morris nee Burden. ALS. 1p on correspondence card. Kelmscott Manor, Lechlade, Gloucestershire. July 4th 1937. 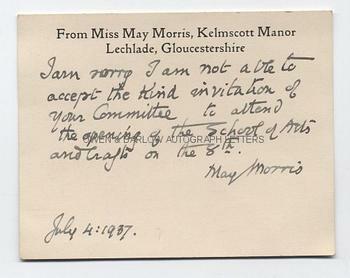 "I am sorry I am not able to accept the kind invitation of your Committee to attend the opening of the School of Arts and Crafts on the 8th." Approx 4.5 x 3.5 inches. Fine. Mary "May" Morris was a great beauty in her youth and was immortalized by her father's friend (and her mother's lover) Dante Gabriel Rossetti in his 1872 portrait. From the studio archive of the Malvern artists Victor Hume Moody and his daughter Catherine. V.H. Moody was principal of the Malvern School of Art (1935-1962), in which post he was succeeded by his daughter. He is sometimes known as "the last classicist painter" and he and his daughter were opposed to the onset of modernism in art. The School of Art at Malvern had started life as a technical college but by 1937 was being relaunched as an institution specialising in the teaching of painting, design and crafts, such as printing and bookbinding. It appears that it was to this reopening that May Morris was invited to attend.